ANDOVER — There are as many ways to approach art as there are artworks and artists. For more than two centuries, what may be the most common has been to see art primarily as self-expression. An individual’s having made a certain work is seen as that individual’s expressing something about him- or herself. Another approach can be just as revealing of meaning, or even more so. 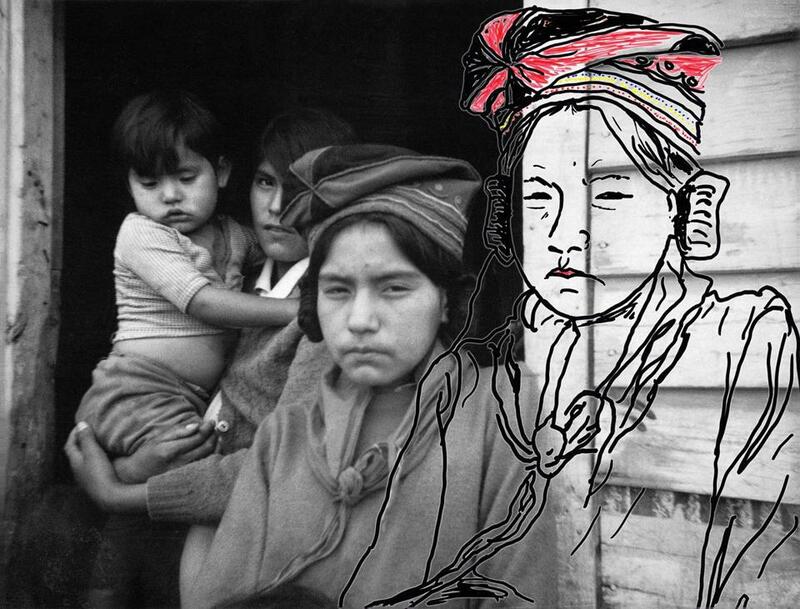 It’s to see art as an expression of cultural identity — and thus also a contributor to helping form that identity. Two otherwise very different shows at the Addison Gallery of American Art richly explore this role art can play. “Pekupatikut Innuat Akunikana/Pictures Woke the People Up: An Innu Project With Wendy Ewald and Eric Gottesman” and “People, Places, Things: Symbols of American Culture” both run through Jan. 13. The Innu live in Quebec and Labrador. They were the last indigenous group in Canada to gain suffrage. That was in 1969. The photographer Wendy Ewald visited the Innu that summer and taught several young people how to use a Polaroid camera. Thirty-eight years later, she returned, along with the photographer Eric Gottesman. They showed the photographs from 1969, using them to initiate discussions about Innu life then and how it had changed over the intervening years. Another group of young people began taking photographs. A vote was held to select images to be put on oversized vinyl banners that would be hung in public settings. The camera was put to use as a kind of communal tool. The exhibition consists of several elements. Some of the 1969 Polaroids hang outside the main display. The gallery proper offers several sets of photographs, as well as three videos. The first set comprises black and white images taken by anthropologists and ethnographers between 1881 and 1957. These are emotionally detached, taken from outside the culture. For all that they are presented with dignity, the sitters are as much specimens as individuals. Conversely, photographs from 2008 shot by young Innu are emotionally connected, taken very much from the inside. That’s true, too, of photographs of the banners, from 2009. The scientific photographs have a nobility, even a kind of grandeur, but in their well-intentioned way they verge on taxidermy. Taxidermy is the last thing you think about with the more recent pictures. The most remarkable thing in the show is a video about watching a film. In 1951, the cinéma-vérité pioneer Richard Leacock recorded footage of the Innu. (Is there anything that eluded Ricky Leacock’s camera?). The video consists of Innu watching the film nearly a half century later. Seeing the viewers’ faces as they watch, listening to their comments, is to feel decades collapse. A seemingly insuperable when gives way before a collective who . The photographs and videos in the Innu show are very conscious of how they affirm, shape, and reclaim a people’s identity. With the paintings, prints, and photographs in “People, Places, Things: Symbols of American Culture,” the process is diffuse and mostly unconscious. 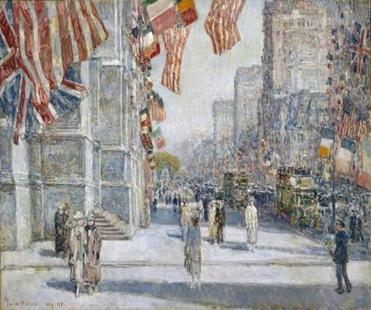 Not always, of course: Florine Stettheimer’s charming “Fourth of July Number 1” wears its nationality on its painterly sleeve; ditto Childe Hassam’s flag-filled “Early Morning on the Avenue in May 1917.” But such works are an exception here. Americans are a vastly larger people than the Innu, in a much larger setting, with a far less exact sense of what defines them as a people. Hey, one of the great things about America is how, well, un-American definition is (self-definition, in this context, is like self-deportation, only even less feasible). Indiana Jones’s “I’m making this up as I go along” ranks with “In God We Trust” as a national operating principle. Still, certain images, themes, and concepts have demonstrated staying power over the course of America’s existence. Certain sites and structures have loomed large. The color combination red, white, and blue hasn’t exactly lacked for prominence. Rodeos and skyscrapers (several images of both are in the show) have proven to be iconographically robust as expressions of America as, say, croquet matches and Quonset huts have not. “Yo-Semite.” Lee Friedlander’s Mount Rushmore isn’t exactly the one seen on postcards. Of course the beauty of this show, as of the Innu project, is that it just begins where postcards leave off.